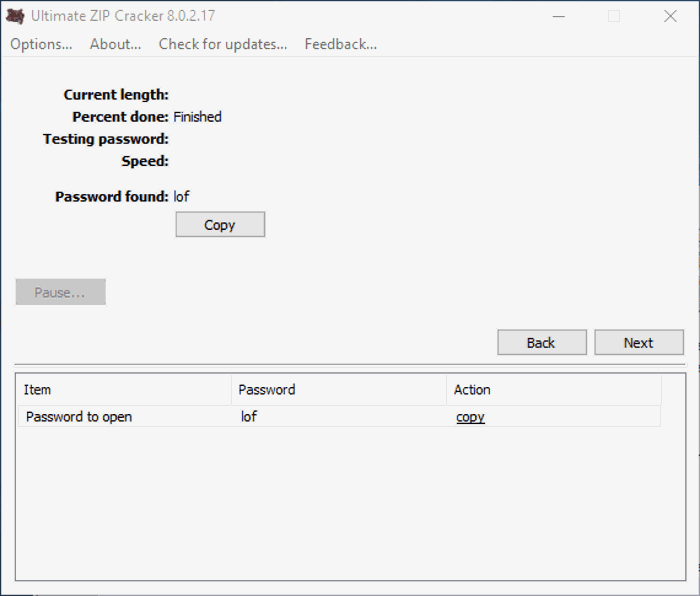 Here is a list of Best Free ZIP Password Unlocker Software for Windows. You can recover password of locked ZIP files, using different methods of the listed software. You can use these software to recover ZIP files, RAR files, archive files, and other files as well. Generally, the most used methods used in these ZIP password unlocker software are Dictionary method and Brute-Force Attack method. You can use both methods depending upon situation. If you remember password length and if it had numbers and upper cases, you can use Brute-Force attack. If you don’t know anything about the password, but remember that it is a standard word, Dictionary method can be used to unlock ZIP password. There are other methods as well, that these software to recover ZIP password provide. Read the article and you will get to know about them. You will also know how to unlock ZIP files using these software. Note: Most of these software are paid, but they do have free trial or demo versions that you can use. However, all of them come with a limitation that they show only first few characters of the recovered password. So, if the password that you are trying to recover is pretty small (5 characters or less), then these software will be definitely useful. However, if the password is longer than that, then you will be able to see only the first few characters, and take a guess at the remaining part of the password. If you know a significant part of your password, like the first three letters, you can use masking option available in some of these software. This will display the full recovered password, if your password is 5-6 characters long. I like Atomic ZIP Password Recovery the most for ZIP password recovery. It has a limitation on the number of characters it shows in the recovered password. It shows 5 characters, which is more than what other ZIP unlockers provide. It uses automatic, manual, and dictionary modes to unlock ZIP password. You can also checkout the list of best free Zip/Unzip Software, RAR Password Unlocker, and File Recovery Software For Windows. 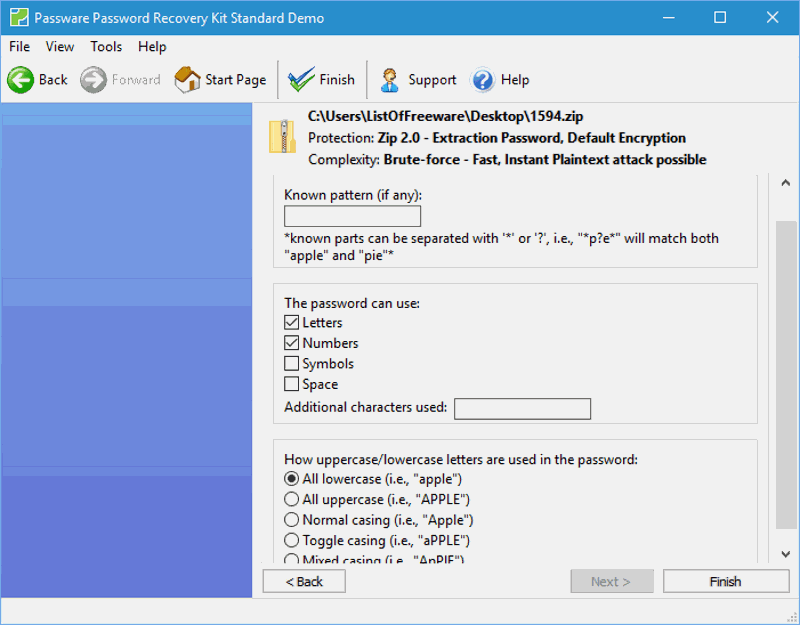 Atomic ZIP Password Recovery has a free demo version of its ZIP password unlocker tool for Windows. It follows 3 different methods to recover ZIP password. You can let this software automatically run trials for password through Automated Mode. Another mode is Manual Mode, which lets you manually set filters for printable characters, custom symbols, upper case and lower case alphabets, numbers, space, and password length. The third one is Dictionary Mode, which lets you add a dictionary with certain set of words/keywords. The software runs trials for the words included in dictionary with different upper and lower case combinations. You can manually add other dictionaries to look for keywords. The demo version lets you recover passwords upto 5 characters only. If the password is of more than 5 characters, then the extra characters are hidden by * symbol. Brief Scan: It runs a trial for most common passwords. Brute-Force attack: Password can be found out by setting filter for password length, numbers, upper case and lower case letters, special symbols, space, etc. Dictionary: A default dictionary can be used to search from a set of keywords. Phonetic attack: Combinations of keywords in mixed upper case and lower case are used. Date Search: Various combinations of dates are used to run trial for ZIP password recovery. Free Type Validator: Make manual entry to run hit and trial. Customized search: If you have set structured passwords, like web address or if u remember a fixed part of a password, like a name, password can be recovered using this method. Set password thread processing to low, normal, high, or highest priority. The limit to show password for the trial version of this software is up to 4 characters only. Zip Password Tool is a simple tool to unlock ZIP password. It only runs Brute-Force attack method to recover ZIP password. Here you can set maximum and minimum password length to check for password. Set options if you want to include digits, uppercase alphabets, space, symbols, etc. for password search. 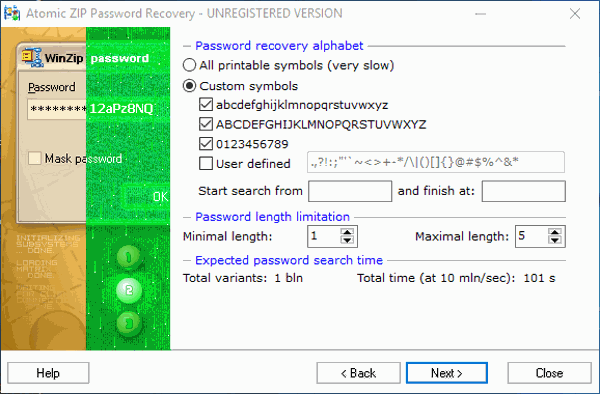 As it is a free version, you can only recover first 4 characters of password. Non-dictionary but similar to dictionary words. If you know nothing about the password. You can set search parameters for password length, upper case letters, lower case letters, symbols, space, or patterns. For the above mentioned options, it follows Brute-Force attack method to recover ZIP password. You can only view the first three letters of recovered password by this free version of ZIP password unlocker. It runs a search for just 1 minute. Unlock ZIP password with WinRAR Password Cracker. It boasts of two ZIP password recovery methods, which also let you unlock RAR password. Brute-Force attack method and Dictionary method can be carried out for ZIP password recovery. 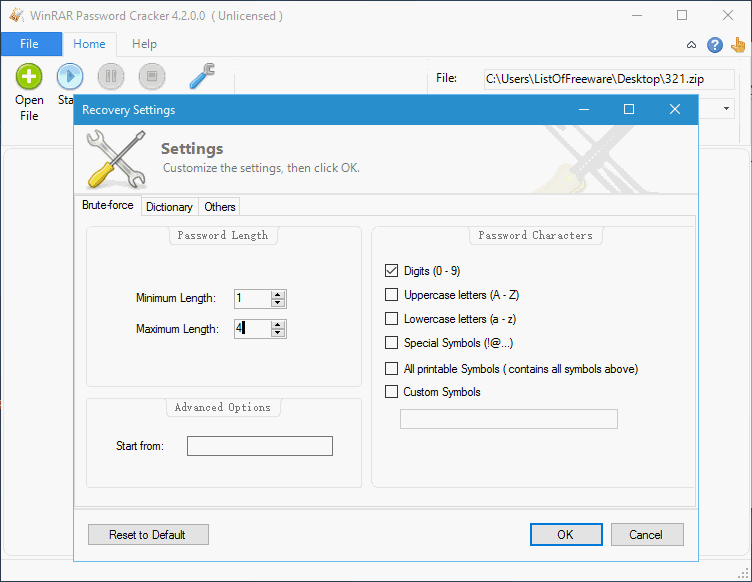 Set password length, character set (digits, uppercase, lowercase, special symbols, etc.) for Brute-Force attack. For Dictionary method, set dictionary file path and start line to unlock RAR. Only first three characters of password are displayed in the free version. ZIP Password Geeker lets you unlock RAR password for free. There are 4 methods which you can use to unlock ZIP password; these are: Brute-force, Mask, Dictionary, and Smart. When you select a mode to unlock RAR, you will have to set some parameters (for each mode). This ZIP password unlocker lets you unlock ZIP password under projects. You can set maximum character length and minimum character length for password. Set options if you want to include lowercase letters, uppercase letters, numbers, space, and special symbols for search. A high priority can be set based on the urgency of situation. You can also take a look at activity log by saving it for each process. The free version is a trial one, and only lets you view the first 3 characters of extracted password. You will have to buy the full version to get rid of limitations.